A sapling emerges from the ground and begins its journey to becoming a tree. 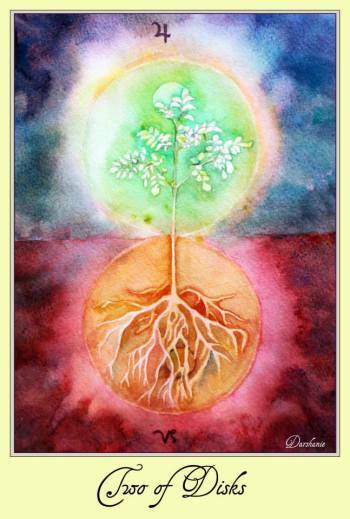 This card heralds change and growth from one form to another. A seed begins to sprout and shows itself above the surface of the earth. This seed carries potential form and life. As it sprouts, that possibility can begins to actualize. At this early stage it is very delicate and it relies heavily on the grace of the sun, wind, rain and seasons. This card is about manifesting into the physical world. 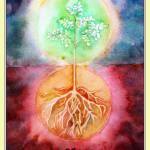 Within the earth the seed is still in an internal state and it has not yet been presented to the world. But when the seed breaks through the earth, its potential is activated and its vision is articulated and communicated. It begins to face the world and if it is nurtured by the elements it will grow. The beginnings of a great tree is often humble and small. But with time, patience and support, it can huge, strong and rooted. Any undertaking needs to have deep roots in the internal dimensions of your heart and imagination to weather itself through storms. A tree needs to be rooted. Roots and branches must grow in balance with each other. A tree should not extend itself beyond what its roots can support.If its roots are too shallow then it will depend on the support of society and circumstances which are always fluctuating and it might not have the strength to become a great tree. It is easiest to manifest what you are passionate about. In the Two of Disks your endeavor has met its first step in establishing itself. It still needs a lot of planning, time and support to reach its potential. At this stage it is important to pace yourself and utilize what you have. It is important to carefully juggle resources in order not to over extend yourself. Jupiter is in Capricorn which is favorable for growth and expansion if hard and consistent work is applied. Growth takes time and resources. You have to budget your time, energy and money to make it through the long haul. Come up with your financial plan, communicate your mission statement and proclaim your direction. Your project is young and its well-being will fluctuate according to the outer influences of sunlight, rain, wind and seasons. You are reliant on and need the support of your community.You might need help from your neighbors and friends to get by. Keep your vision strong and keep your roots nourished by staying in touch with your passion. Keep your body strong for all the hard work ahead. This is just the beginning.